We enjoyed our stay at Villa Pagano. The garden is beautiful and the house is very nice, including the outside kitchen, the terrace with views of the sunset and Mt Etna and the bonus of a pool. Having air conditioning in the bedrooms was great. Gaggi itself is not particularly interesting although the location is very convenient for Taormina and Mt Etna and a ton of pretty villages. Giovanni is an excellent host - we very much enjoyed the pizza dinner - and is full of helpful information. The house cost a little more than we expected when you include cleaning and parking fees compared to some alternatives we looked at and, as one might expect, the garden also attracts a lot of wasps at this time of year. But overall this is a very pleasant place to stay indeed. We had a great two weeks at villa Pagano. The villa was perfect for our family of 6. We lived outside, around the pool, surrounding by a beautiful garden and eating and cooking in the fantastic outdoor kitchen, it really was an idillic paradise. The villa is about 25 minutes from Taormina and 45 minutes from Catania and is ideally situated for exploring the eastern coast of Sicily. A car is essential and be prepared for narrow roads! There is a lovely bar in the village which we frequented for morning coffee and pastries or evenings for a glass of prosecco or aperol!! The local supermarket is a 10 minute walk from the villa. People were friendly and very welcoming. Mr Pagano was very welcoming and very helpful with good advise and ideas. Fantastic Holiday Rental surpassed all of our expectations!!! Villa Pagano is a wonderful home set in the countryside of Gaggi, Italy. Myself, husband, and 13yr. old daughter were excited to spend our holiday taking in everything that Sicily has to offer. This villa is charming and suited all of our needs and wants. The home itself offers 2-3 bedrooms, 2-3 baths, pool, an indoor and an outdoor kitchen, as well as the pool and outdoor shower. 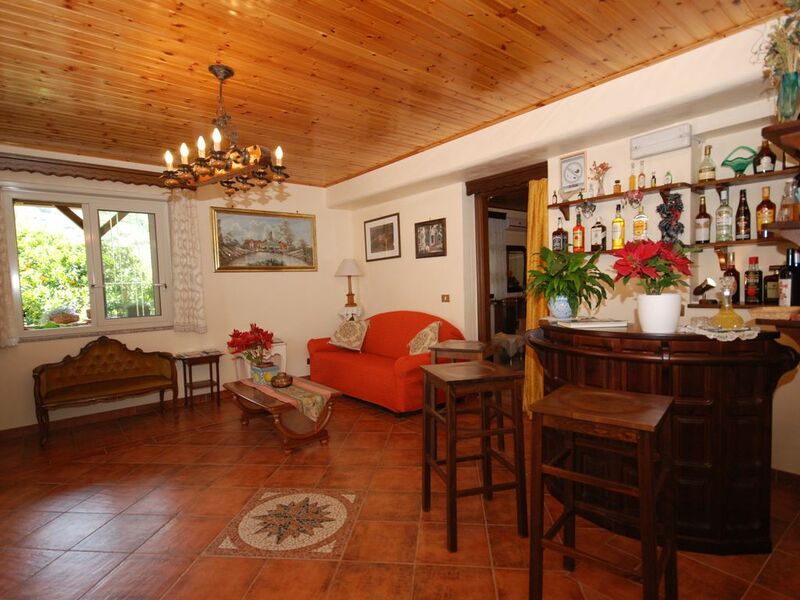 With private, gated entry you are safely tucked in to a wonderful piece of Sicilian paradise. The villa is surrounded by citrus, and olive groves. At any time, there are fresh lemons, oranges, mangos, peaches, grapes, kiwi, kumquat, and bananas. The owners, Giovannini and Angela are simply two of the greatest people ever. They are available for directions, restaurant suggestions, sightseeing, or just learning about the land and the culture. They do not live on the property while renting. However, they are local and we had lunch with them and thoroughly enjoyed their company. The hospitality and the kindness they showed us was worth its weight in gold. Their pizza night was delish. Prepare to be treated to a 5 star at home dining experience. Homemade vino, olive oil and limoncello. The terraces allow for breathtaking views of the countryside and Mt. Etna. My husband and I would spend hours on the terrace watching the stars, and enjoying the peaceful landscape. The local church bells play at 8 am and 8 pm daily. It was picture perfect and just the relaxation we needed from our busy lives. If you are looking for a place in the city, this is not for you. If you are looking for rest and relaxation, yet close to the beach(10 min by car) and Taormina (15-20 minute by car), this is definitely the spot. We will definitely be returning in the future. Villa Pagano is our new home away from home in Sicily. The Alcantara gorges are only 7km from the house, and Mt. Etna is about 45 min by car. Oh, and the outdoor kitchen is absolutely FABULOUS. We had dinner in a few times to enjoy the wood fire oven. Simply paradise in every way! You will not be upset with this rental! The object offers plenty of room for six. The Villa itself contains two sleeping rooms (parents and two Kids) plus an additional integrated Apartment for a couple. The integrated aparement is offered for an extra fee. Indoor and outdoor kitchens with plenty of space are available. The BBQ can be used by yourself, the pizza oven can only be operated by the owner. The landlord offers superb Service which includes fresh fruit for free. Parking, extra towels for beach and pool as well as Liquor and wine is offered with additional payment. Everything is worth it! The Conad Supermarket (5 minutes by car) offers everything that should be required, apart from charcoal. For Google Maps on your mobile you can use as location 37.858490, 15.228968. The owner is always avaible for your requests but never intrusive. If we will stay on Sicily again, it will be in Villa Pagano!